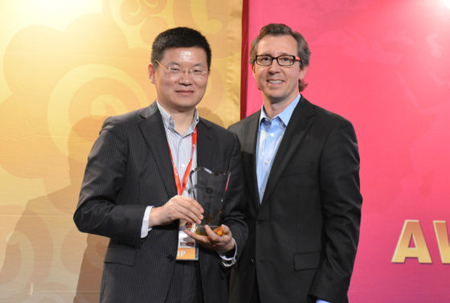 Yifang Digital Technology Co., Ltd. received the "Annual Best Innovative Application Award" for its latest stylus pen at the awards ceremony of the "2012-2013 Consumer Electronics Top 10 Brands from China". The ceremony was held in Las Vegas on January 9, coinciding with the 46th Consumer Electronics Show (CES), which took place from January 8 to 11. The ceremony attracted the presence of more than 300 media outlets home and abroad and drew attention from the industry around the world, and it gave the Chinese consumer electronics industry an opportunity to collectively demonstrate their brand strengths and showcase their premium quality and wisdom to the world. Sponsored by IDG and co-sponsored by top research firm IDC and CEO CIO Magazine, the annual event aims to present the glamour of Chinese brands to the world. Yifang was the gift sponsor that provided the magic power of Touch 8 digital pens during the award ceremony. Touch 8 is a Windows 8 peripheral device for the "post-mouse era" that upgrades a PC screen to a touch screen, improving the Windows 8 user experience. The technology of the touch pen, which stems from Israeli two-dimensional positioning and tracking military technology, enables users to activate all applications by simply touching, sliding, swiping and dragging the pen. It can be used to view the web, check email, zoom in and out on pictures, play games, and annotate documents, all by touch. All in all, the Touch 8 easily solves problems brought by Windows 8's launch. a human interface device and no separate drive need be installed, making it useful for a variety of occasions, such as business meetings, education and entertainment.